It’s a fake. I know it’s a fake. 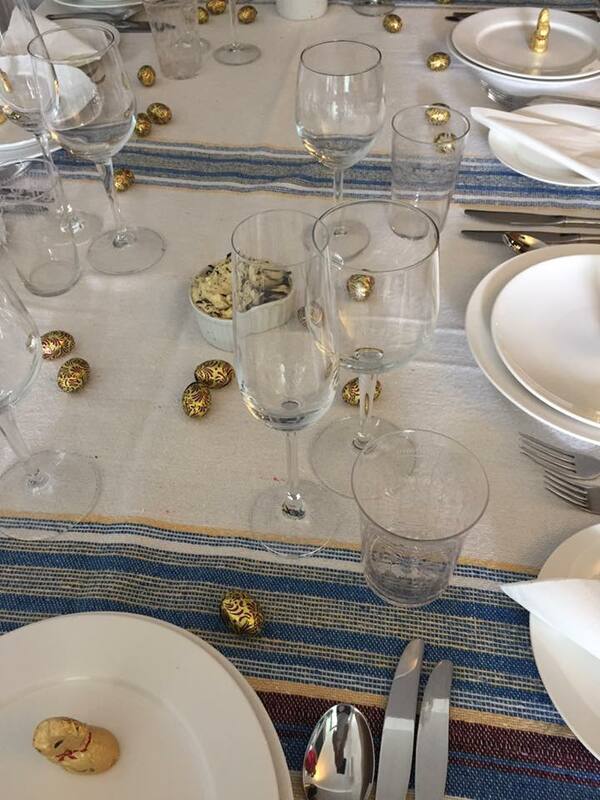 This family tradition of an Easter Feaster is based on a whole lot of wrong thinking. For a start, as a family of non-believers, we can hardly claim a reverence for the religious significance of Easter. So the symbolism of the Easter lamb isn’t really a factor. And the seasons are all wrong. In Europe, Easter coincides with the arrival of spring, so Easter dishes typically feature spring vegetables. Here, it’s autumn. So the asparagus for our ‘spring vegetable’ lasagne is imported from Mexico. The peas are frozen. The lamb itself is more likely two-tooth. Then, of course, our heritage is wrong. We’re Cornish and Irish and a bit of Danish and a bit of German but, for many generations, simply Australian. Our most authentic Easter customs are hot cross buns and chocolate and, for us, Christmas has traditionally been the biggest annual celebration. 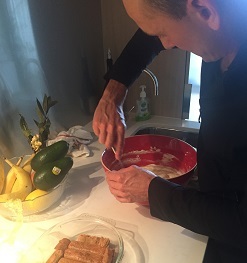 Still, we persist in alternating Greek and Italian Easter dishes, just because we can. The tradition started when we lived in the country town of Bungendore, outside Canberra. Our daughters, all living in Melbourne, would descend on us for the Easter break, often with friends in tow. It seemed natural to make it into an occasion. Now we’re in Melbourne too, but the tradition continues. It was Italian this year. So a glass of Prosecco seemed appropriate to start. Knowing that lunch was to be something of a marathon, we kept the antipasto simple and didn’t linger too long over the artichoke hearts, olives and prosciutto. There was a bit of lingering over the fresh bread with truffle butter though. We happen to have quite a lot of French black truffle in our freezer (it’s a long story – don’t ask). Grated into cultured butter it added a touch of luxury. And black truffles are also produced in Italy, so we weren’t really straying too far from our theme. The ‘primo’ for our Italian Easters is always lasagne. I’ve made this one before. 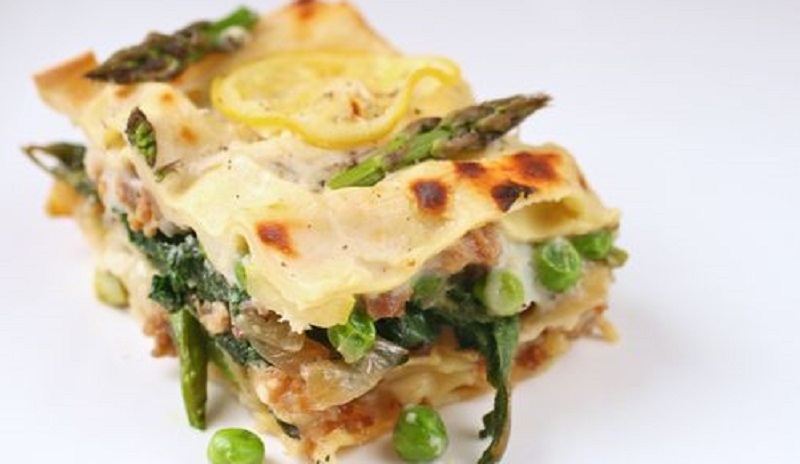 It layers the innards of Italian sausages, asparagus, peas, leafy greens and béchamel with the lasagne sheets. The greens are supposed to be nettles. This year, nettles not being on offer at our favourite fruit and veg store, we used silver beet. The first time I cooked this I gathered armfuls of what I thought were nettles from our country garden in Bungendore. It was only after it was devoured and proclaimed fantastic that I discovered that those ‘nettles’ were actually lemon balm. Fortunately, I had omitted the lemon slices called for in the recipe, so the slightly lemony taste probably came out about right. For ‘secondo’ it had to be lamb, of course. This meant getting up at a distinctly unholy hour for Easter Sunday to start the slow-cooked shoulder. We’d done some of the prep the night before, so the mirepoix (carrot, onion, celery, leek) had been duly softened and the various other herbs and veg added. This dish uses four kinds of beans: cannellini, borlotti, broad beans and yellow beans. Except we couldn’t find yellow beans. So we used green ones. Sometimes everything just works. The Prosecco was followed by a couple of good Italian reds. The lasagne, having been baked the day before, had settled nicely and held together in attractive slices. The lamb shoulder pulled apart exactly as intended. The beans looked pretty and, having cooked in the lamb juices, tasted luscious. The potatoes with rosemary crisped up beautifully. We were groaning by this time, but still managed to attack the tiramisu. This was a labour of love from our daughter and her partner. With the help of a Youtube video on how to whisk egg whites if you don’t have an electric beater, they produced an airy alcoholic dessert that was a perfect conclusion to the meal. Will we have another Easter Feaster next year? Probably. Will it be Italian or Greek? Or possibly even Spanish, just for a change? Well, I’m already researching the Spanish Easter traditions and this Easter pie sounds pretty tempting.